I’m just finally sitting down to my computer for today. I spent the day doing normal things. Garage saling. Grocery shopping. Picking out some paint. Buying a pair of pants (I really need to lay off the Dr. Pepper…), just to detail a few errands. Very normal things. Five years ago was oh-so-different. “Normal” was a distant thing, something I dreamt of but worried would never be part of my life again. 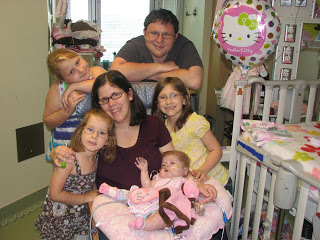 For eight months, I’d lived in a hospital room, sleeping mostly on small pull out couches or, more often, pull out chairs beside my daughter’s hospital bed. I’d relocated my whole life there. I had a “desk” set up to work from there as much as possible so she could continue to have insurance. I as much as ignored my other children much to my hindsight regret. I manically bought her clothes, hoping, believing, that she would make it home to wear them. But normal? Oh, something so sweet, so taken for granted–I just wasn’t sure it existed anymore. Five years ago, as I type, we were getting a ray of hope. A glimpse that just maybe, someday, we could experience some version of a new normal. 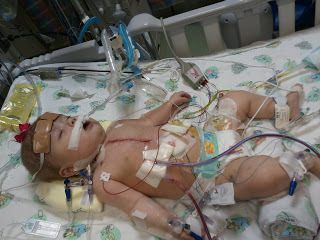 Annabelle’s new heart was arriving. I remember specifically because it was around 7pm that they called us, telling us that she was prepped and ready to receive the heart, and the heart was almost there. And even though I tried REALLY hard not to think of it, lest I completely have a nervous breakdown, a small part of my heart wept. Wept at the realization that my daughter was having a chance at “normal” while another family was having that ripped away from them. Their lives would really, truly never be the same. They were experiencing what I had nightmares of for 8 very long months. A reality that I lived in as a possibility every single day of Annabelle’s life. That my child would die. 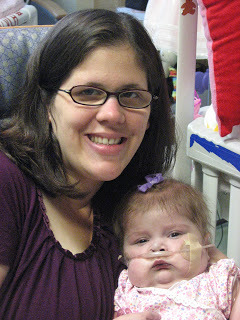 Five years later, I look at my sweet girl. Life is not perfect. Goodness, is it ever?!? The road has not always been an easy one, but goodness, is it EVER? But my beautiful daughter— oh I am so thankful. So thankful for a family who gave a precious gift in their time that their world was being wrecked. That they allowed a sweet little girl (Oh, sorry, BIG GIRL, as Annabelle so often corrects me lately!) to live. She loves pizza and spinach and goldfish and dipping everything in sight in either ranch or ketchup. She’s come from not eating a thing one year and being fed via a tube to eating everything she get her hands on with gusto. She is not perfect. Sometimes her sillies come out when they should stay in our pockets for silly time. Sometimes she screams when she should talk nicely. Sometimes she throws a fit when she doesn’t get what she wants. She has some really big fears that we are trying to tackle as gently as possible, not the least of them are “pokie pokies” that she has to get WAY to often. 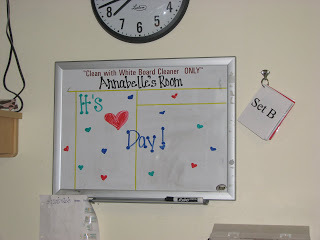 So today, we celebrate Annabelle. We celebrate a God who has brought beauty out of great sorrow. A God who knows the pain of losing a child because he lost one too. And we celebrate the gift of “normal” days. May we never look at a normal day and frown that it isn’t as great and fabulous and adventure filled as others. Because even normal days are great gifts. Gifts to be treasured, because they are not always promised, or guaranteed. 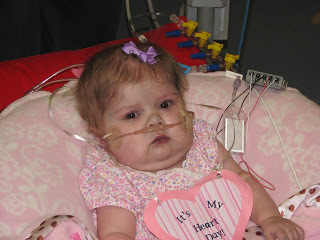 Happy “normal” Heart Day, sweet Annabelle. Your mother loves you more than the very breath I breathe. And to a family out here who is grieving today, please know that a part of my heart will always ache with you. I will never forget the gift you chose that day, and continually pray for you all. Sweet Nurse Jessica made her a heart necklace to wear!! 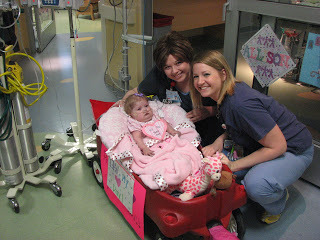 The traditional “wagon ride” around the pod with “it’s my heart day” signs! All goals changed this day!!!! Post op. She looked so sad… yet so pink! 2016 — NORMAL Day. Momma’s hair is a mess. Annabelle is in pawprint pajamas (she got new today on her special day) and big smiles by all! SO VERY THANKFUL!!! !